As roller coasters go this one is fairly tame. It's a short ride (about 60 seconds), with no big drops or special effects—just your basic coaster. Some would probably classify it a "kiddie coaster," although would put it one step above that. There is a height requirement, so very small children will not be able to ride. If you are familiar with Tokyo Disneyland Park's Gadget's Go Coaster you already know what Flounder's is all about (although Flounder's is just a little more subdued than Gadget's). 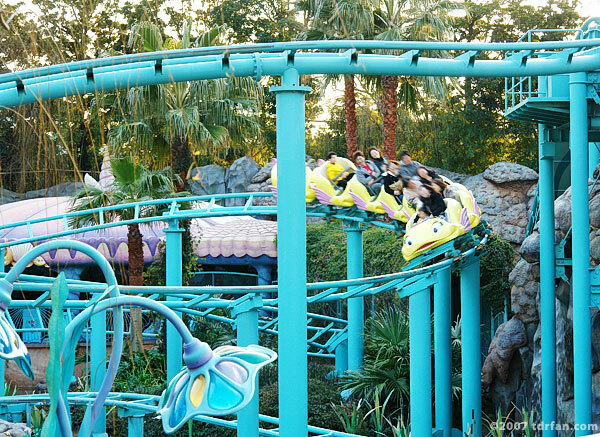 The colors and layout are different, but the ride and the thrills are pretty much the same. This is a smooth, fun little coaster, and if the lines are short (which is often the case) it's worth stopping for a ride.